Stems: Erect, branched in inflorescence. Leaves: Alternate, stiff, obovate to ovate in outline, pinnately-divided to lobed or nearly entire, glabrous, margins wavy, with prickly spines, base clasping with rounded auricles; lower leaves 1.5 to 6 inches long, .4 to 3 inches wide; upper blades much reduced and less divided. 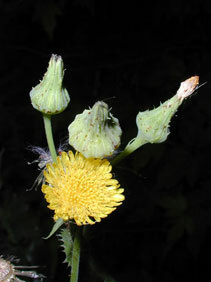 Inflorescences: Heads, 3-25 in corymb-like cluster, terminal; heads flask-shaped, 1/2 to 1 inch wide; phyllaries lanceolate to linear, 1/3 to 3/5 inch. Flowers: Involcure up to 3/5 inch tall; florets 50-150, all ligulate, fertile; ligule shorter than corolla tube, corolla yellow. Fruits: Achenes, flattened, about 1/10 inch long, 3-5 ribs on each face; pappus of white, hair-like bristles, 1/4 to 1/3 inch long. Habitat: Moist disturbed sites, waste areas, gardens, roadsides, and cultivated fields. Distribution: Principally in the east 1/2 of Kansas, but scattered west. Comments: This weedy species can accumulate nitrates, but is rarely consumed by livestock. Latin asper means "rough or "prickly".